Lenovo IdeaPad U1, a hybrid computer scheduled for a Northern Hemisphere summer release, has been essentially shelved by Lenovo, according to a quote given to the Engadget website. Although journalists had only had a brief look at a prototype of the computer at CES this year, it was an exciting bit of thinking from the Chinese company. It called the device a hybrid computer. It looked like a notebook computer, but the screen could be separated from the machine to became a tablet computer. Each had its own battery and storage, and when together the computer would run on Windows 7, the tablet when separated would run Linux Skylight. You can read all about it, and watch a video demonstration of the machine in our story Lenovo IdeaPad U1 tablet – it’s real, and it’s out soon. After careful consideration of market conditions and user feedback, Lenovo has decided to focus its resources on building a family of next-generation mobile internet devices based upon open technologies such as (but not limited to) the Android kernel, similar to the Lenovo smartphone, which is available for sale in China now. 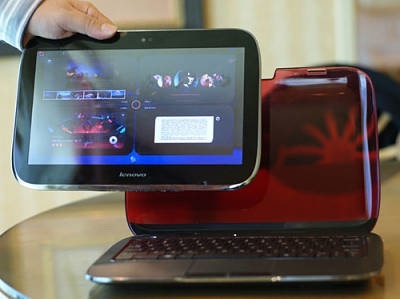 As a result of Lenovo’s strategic shift towards open standards such as an Android kernel based environment, the Company has shelved its plans to release the initial version of the Skylight smartbook that featured a proprietary Linux based OS. Lenovo remains committed to working with our strategic partners to deliver innovative products in the growing mobile internet space, including the aforementioned smartphones and smartbooks, as well as exploring innovative new concepts that continue to “push-the-envelope” like the U1 hybrid PC.